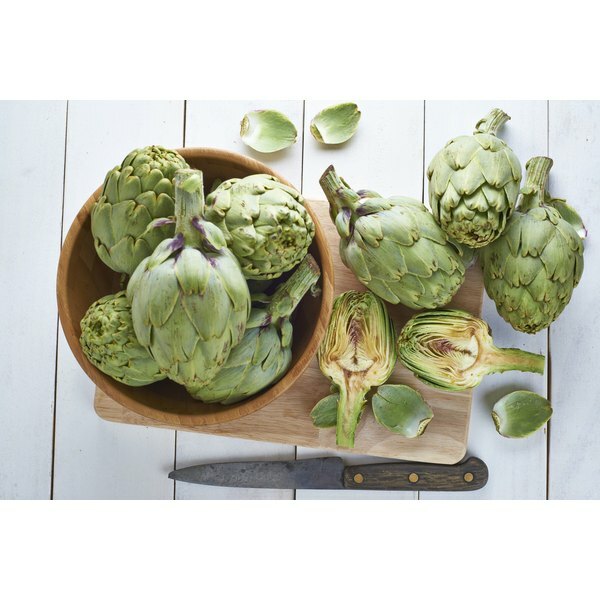 Artichokes have been used to treat everything from liver problems and jaundice to anemia, while artichoke leaf extract has been found to help lower serum cholesterol and triglycerides. You should always consult your doctor about alternative treatments for your medical problems; however, if you enjoy the flavor, artichoke leaf tea can be enjoyed for its own sake, not necessarily to treat any condition. Herbal teas such as artichoke leaf are a caffeine-free alternative for those who don't want to consume caffeine or who want something warm to drink in the afternoon or evening. Heat water in a teapot to about 208 degrees F. If you don't have a thermometer, just bring the water to a boil -- which is 212 degrees F -- and remove from heat for a minute or two. Pour water into your cup or mug and immerse the tea bag. If you have loose-leaf tea, use a tea strainer. Let steep for four to five minutes. If you steep the tea longer, the flavor will be stronger, but the tea may taste bitter. Remove the tea from the mug and serve. Add milk and/or sugar to taste. Herbal teas such as artichoke leaf can withstand higher water temperatures than other teas. If you're making green, white or oolong tea -- or an artichoke leaf tea that is blended with one of these teas -- keep the temperature around 175 degrees F.